Like the convenience of an instant PDF download but still want a hard copy of this book? Order both and save 15 percent! Dual Approach to Patient Engagement: Activating High Utilizers and Coaching Clinicians describes PinnacleHealth System's two-pronged strategy for prioritizing patient engagement within its culture, and elevating key quality and clinical metrics in the process. Outlining PinnacleHealth's use of health coaches to both engage its highest risk population and polish providers' engagement techniques is Kathryn Shradley, director of population health for PinnacleHealth. In this 25-page resource. Ms. Shradley explains how her organization effects this culture change via education, awareness and interventions built on a foundation of health literacy. This report is part of the HIN Healthcare Case Studies series, which bundles inside details on innovative programs from leading-edge healthcare organizations on a range of topics — all aimed at achieving healthcare's Triple Aim of improving the patient experience of care, improving the health of populations and reducing the per capita cost of healthcare. 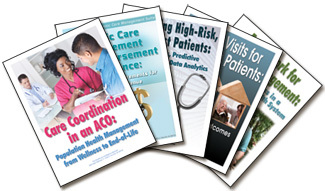 If you are already a HIN Healthcare Case Studies subscriber, then this report is FREE for you. Learn how you can save with automatic digital delivery of HIN Healthcare Case Studies.